Aphids, scale insects, and other pests are a threat to any farm or garden, but pose a particular problem for organic gardening. For years, the most common answer to this threat has been the use of poisons, and our soil and produce have paid price. Thankfully, healthy plants are their own first line of defense against pests and diseases; organic compost and well-fertilized soil will help plants be their best and rely on their own natural resistances. Even the healthiest plant, with its natural defenses, will still need help to fend off pests from time to time. Migrating insects and other nuisances can be attracted to more robust foliage and fruit that more vigorous plants offer. Luckily for the organic gardener, there are several natural alternatives to chemical poisons. “Insecticidal soap” may sound as toxic as the chemical pesticides you see in the store, but it is so safe that you use it in your kitchen every day. Common dish soap has been used as a natural pesticide for longer than most chemical pesticides have been around. It is inexpensive, virtually non-toxic to birds and other animals, and leaves no harsh residue. Simply add two tablespoons of unscented dish soap to a gallon of warm water and spray it on your plants in the evening; if you live in a warm, sunny climate, spray the plants in the morning with water to remove excess residue. The soap interferes with the cell walls of soft-bodied insects, killing them shortly after contact, and also destroys the thin walls of their eggs. You can even enlist weeds in the fight. Try boiling stinging nettles for twenty minutes, allowing the mixture to sit for a day, and then using the liquid as a garden spray. Often the best weapons against harmful insects are other insects that have evolved to prey on them. These predators are inexpensive and readily available from biological supply shops. Always make sure that the species you are using are native to your area before allowing them into your garden. Ladybugs – these beetles are widely known for eating aphids, but are equally effective against mites and scales. Lacewings – adults are fond of aphids, but their larvae are even more voracious, preying on a wide variety of other pests. Praying Mantis – one of the most successful and effect predators in the animal kingdom, there are few pests that the praying mantis won’t eat. 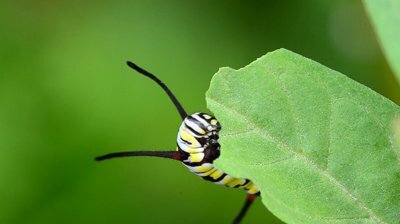 Whether you find yourself employing all of these measures, or if you dedicate to just one, nature has its own means of dealing with chewing caterpillars, weevils, aphids, and other garden pests. By relying on these natural methods, you will always have access to inexpensive, organic alternatives to artificial poisons. Lastly, don’t forget to add some EM-1 in your program. It is compatible with all of these approaches and helps plants thrive, supporting them when they need to fend off pests. First of all, I appreciate your knowledge and experience about organic gardening. Your all suggestions are good Pest control solutions I agree with you. Some pests are very helpful for gardening and play a good role in growth of plants. But some are very dangerous for growth of plants but your tips are helpful in this case. If you think that you can manage it on your own, you can buy pest control supplies in Phoenix AZ.